Happy Monday! I’ll be heading to Singapore for a few days next week – the country is known for its AMAZING food, so I’ll be pigging out there, no question! In anticipation of that, I thought I’d share my dining experiences at a few South-East Asian restaurants in NYC. I recently dined at New Malaysia with fellow blogger Terri. Malaysia and Singapore have quite similar cuisine, so this post will provide you with a glimpse of what I’ll be sampling next week. We started with the Roti Canai (first picture). 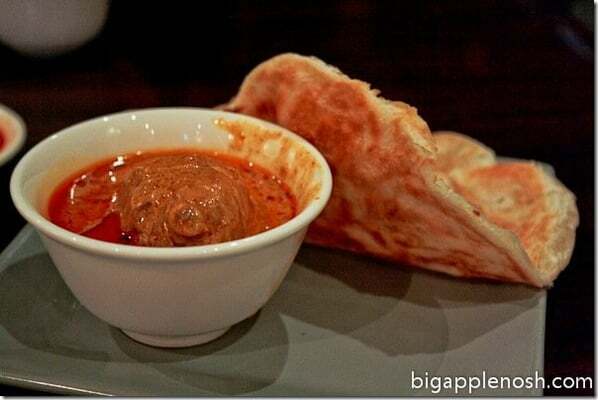 Roti resembles a crispy chewy pancake, accompanied with chicken curry. In Singapore and Malaysia, the chicken is replaced with mutton; however, I’m guessing that chicken is more amenable to the American palate. I loved the roti at New Malaysia, with its crispy and flaky layers and oily curry for dipping. We also ordered the Hainanese Chicken, with a two side orders of chicken rice. 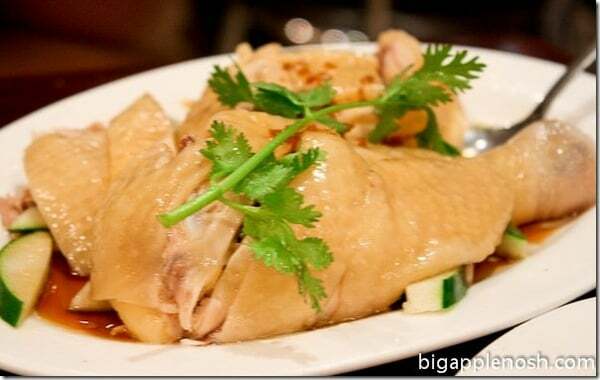 I can best describe Hainanese chicken as poultry in its purest form – the intense chicken flavor of this dish, when prepared traditionally, is mouthwatering. My aunt used to prepare Hainanese chicken rice, as my uncle grew up in Malaysia – this dish always makes me nostalgic! Here’s a tip when ordering Hainanese Chicken Rice. There are usually two ways to order. One method is to order “Hainanese Chicken Rice,” which consists primarily of the delicious chicken-stock rice with a few pieces of chicken. However, I’m a meat-eater. I like my chicken. I order the two components separately – one order of Hainanese Chicken and a bowl of Hainanese Flavored Rice. The reward – a quarter or half-chicken and a big bowl of savory rice. WIN! To round out our meal, we ordered the Chow Kueh Teow – rice noodles stir-fried with soy sauce, chili, belachan and other ingredients high on the umami scale. This dish, while delicious, is also quite user-friendly for the Malaysian cuisine newbie. 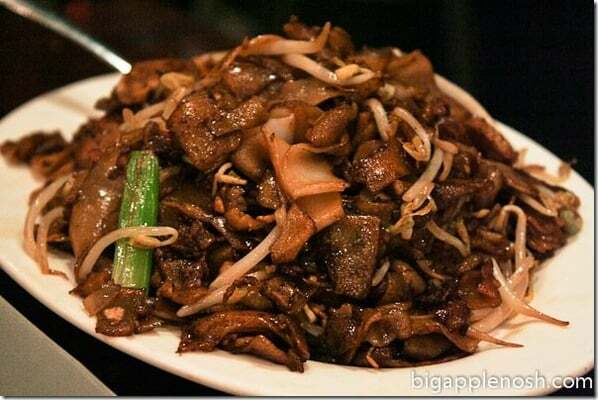 Sometimes called Char Kueh Teow or Char Kway Teow, it’s one of my go-to ordering faves. New Malaysia offers simple and authentic Malaysian/Singaporean food at a great value – this hearty meal cost each of us less than $10. If you’re looking to try this unique cuisine, I would definitely recommend New Malaysia. Authentic Malaysian/Singaporean cuisine at a great price. Have you had Malaysian or Singaporean food before? If so, what’s your favorite dish? Yum! I read a novel set in Singapore awhile back and wondered what Char Kway Teoh was – in the novel, the characters bought it on the street from the "Char Kway Teoh man." It looks delicious! Thanks for the rec! Chicken rice is definitely a must and pepper crab if you eat seafood. My Malaysian friend though said she preferred the Malaysian food in NY! I love Kashmir on Racecourse road in Little India and a bunch of Thai places like the 2 on Purvis St. and A-roy Thai in Funan digital life mall. Let me know if you'd like more recs and I can e-mail them 🙂 Too bad I'll be flying to the US next week! yummeee! my mouth is kinda salivating at the mention of the rice. Ooh, please let us know where all the good stuff is in Singapore – I'll be headed over in November! I agree with Chic 'n Cheap – though sold everywhere, the chili crab and the pepper crab are both uniquely Singaporean and so delish! I can't wait to hear all about your trip to Singapore!! And I LOVE pepper crab – perhaps even more than chili crab – is that a travesty? I heard the salted egg crab is excellent as well! @Chic 'n Cheap Living, I would love your recos! You can reach me at bigapplenosh @gmail.com. Thanks! Wow, this food looks so incredible! I've never had Malaysian food, but I'd love to try it. Now I'm craving Malaysian and there aren't any near me! Wah! My fave Malaysian restaurants are nyonya on grand and penang on … Elizabeth. Sarang burong is a fave of mine! Yum. I'm so nostalgic for Singaporean food. My first stop in S'pore is always Newton Circle hawker center. Nom nom nom. the roti canai looks so delicious. i have to find a malaysian place in my town! This looks really yummy! I've never had Malaysian before; would love to try it! If you head back to New Malaysia, you HAVE to try their House Special Tofu (招牌豆腐 jiu paai dou fu is what the servers call it, it's 家鄉豆腐 ga heung dou fu on the menu). DELICIOUS!! Smoothest silkiest tofu ever.